American AAdvantage Loyalists Can Upgrade to Europe for Less than Free, Free, or Very Little. Overnight in economy to Europe: A night in jail. This story is your way out. 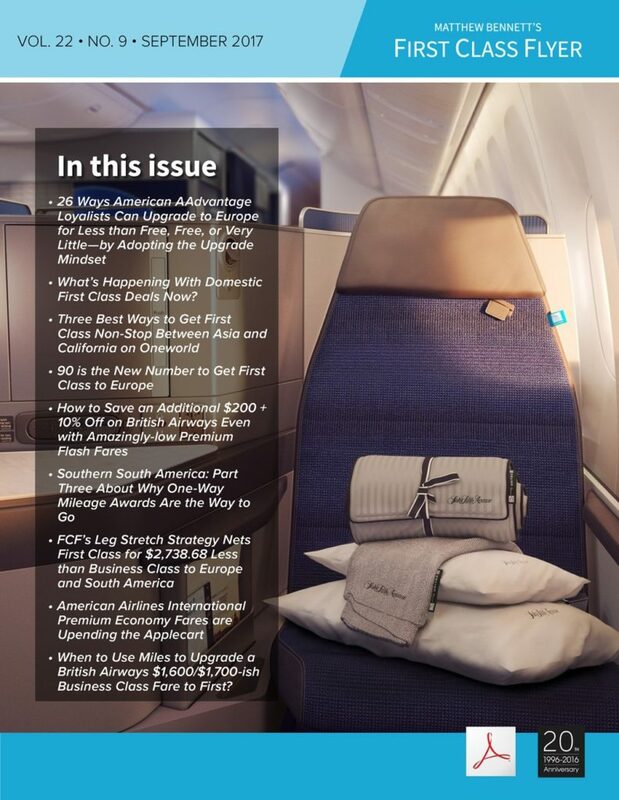 What’s Happening With Domestic First Class Deals Now? The Big Three control your life when it comes to domestic fares. But there are work-arounds and go-arounds. Still a loyalist? Then you’re going to be pushed around. Getting First Class to Hong Kong, your jumping-off point to Asia, is a tough nut to crack. Here’s your nutcracker. How to get a rock-bottom U.S.-Europe fare to bedrock bottom through discounts and promotions available to everyone. Why one-way is the one way to go to South America: Part three of FCF’s series about a powerful, but often overlooked way to get the seat and the itinerary you want. 90. Ninety. 9-0. Meaning booking three-months out. It’s the number to have in mind to get the best First Class fares to Europe. When to Use Miles to Upgrade a British Airways $1,600/$1,700-ish Business Class Fare to First? Six easy steps, but savvy (combining easy discounts, promotions, and credit card bonuses) to upgrade from a low British Airways Business Class fare to First. Voilà. American has ratcheted up its international PE offerings with great prices on very competitive routes. Where you’ll find the best deals.